Most topics and discussions about auto glass pertain to the front windshield. Hardly anyone in the industry discusses rear auto glass replacement. We find this odd because the rear glass is just as important as the front windshield. It’s also composed of different materials. Why Repair or Replace the Rear Window? 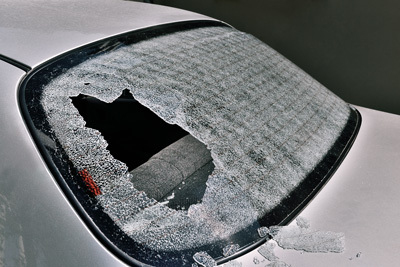 We have seen countless vehicles over the years with a completely shattered rear window. In some of these instances, the owner simply ignores the gaping hole or tapes a large piece of cardboard over it. This leaves blind spots as well as making the car vulnerable to theft. If the window is still intact but cracked, this can pose a danger because it can completely give way, even under light impact. Rear windows are made from a different type of glass than the front windshield. The latter is made from laminated glass, which consists of two to three layers of glass sheets for high durability. The rear window is made from tempered glass, which is more prone to shattering. Manufacturers purposefully design the glass to shatter into little pieces upon a collision. This prevents large and dangerously sharp shards, which can be a tremendous safety hazard for rear passengers. In addition, rear windows also contain a defrost grid. This melts ice and snow on cold winter mornings. For this reason, you can expect a rear window replacement to cost a bit more than a front windshield replacement. If you have a cracked window, Bellingham Detail and Auto Glass can repair it as part of our car protection package. Check our pricing to see our rates for window repairs and replacement. A rear auto glass replacement is a must if the existing glass is damaged or non-existent. Posted on October 28, 2017 under in advice | By ignite.